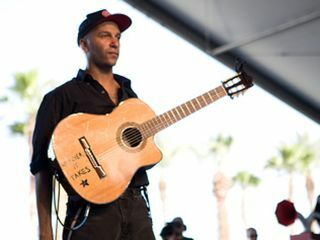 Rage Against the Machine guitarist Tom Morello (aka The Nightwatchman) hasn't stopped fighting the power. He's is one of the artists planning to perform at the Service Employees International Union (SEIU)'s Labor Day Festival. The event will take place on Labor Day, September 1 in St. Paul, Minnesota, where the 2008 Republican National Convention will also be getting underway the same day. Morello will be joined by other artists, such as Steve Earle and Allison Moorer, as well as former Democratic presidential candidate John Edwards. Morello has yet to endorse a candidate for president this year, but he believes that real change doesn't come from government but from the grassroots. "I think that any real, progressive, substantive, radical or revolutionary change for the better that's ever happened in our country has happened because people whose names are not on the ballot, whose names you do not read about in history books, gather together, organize and struggle to make their lives, their community and their country better," he said. The SEIU festival plans to propose a plan for the 21st century that includes affordable, quality healthcare for all, wages that can support families, freedom to join unions without intimidation, and retirement security. Morello has hinted that Rage Against The Machine itself could play outside both the Democratic and Republican conventions, but official plans have yet to be confirmed. And just because he can't sit still, Morello will release his second solo album as The Nightwatchman, The Fabled City, on September 30.